Arty comes from a family of space nuts his Dad is an astronomer, his full name is Arcturus, even his younger sister used to love Space Camp, before she became obsessed with Cheer squad. His own personal obsession is finding life on Mars. He has a signaling system that uses a powerful torch and mirrors and he sends signals to Mars every night from the roof above his room. So far Arty hasn't received any messages from Mars. Although he and his friends think maybe their new neighbor is a zombie. Everything is thrown into chaos when Arty's family has to suddenly move to Las Vegas and Arty meets that scary neighbor face to face. There are many things to love about this surprisingly realistic book. The characters are great, funny, truthful and sometimes ugly, but always very real. 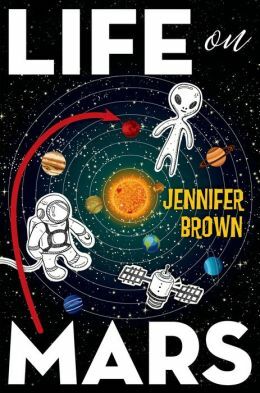 The book is peppered with scientific facts, but because the characters are so rich and their voices so distinct it never feels like encyclopedia definitions have been shoehorned into the text. The plot is tender and funny and also sad. But my favorite thing about Life on Mars is that there are no traditional happy endings, although we close the book with a sense of hope.